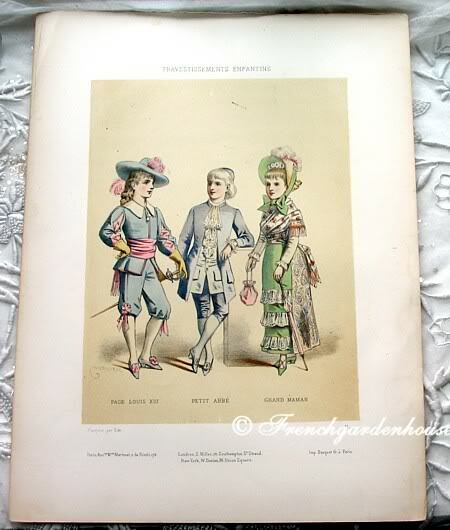 Exquisite antique print, it features three young children entitled "Travestissements Enfantins" which translates to "Childish Dressing~up". 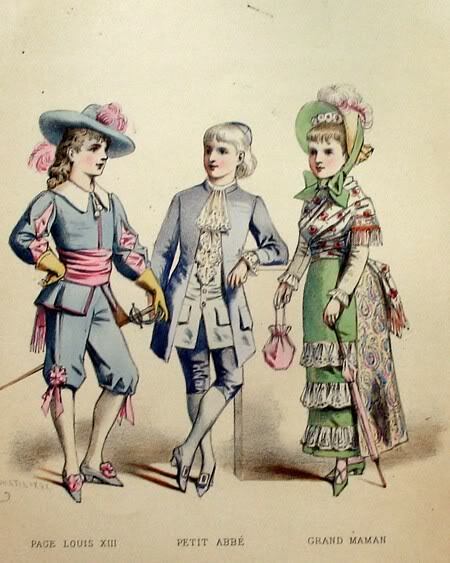 Each one of these three young friends is dressed in a splendid French Costume of the period, the hand painted pastel colors remain bright and clear. Lots of feathers, laces and sumptious details in the costuming, this is one of the sweetest fashion prints we have ever found. Made by Becquet a Paris, in the early 1900's. How absolutely charming for your children's room, or hanging near your collection of antique French Jumeau Dolls and Teddy Bears. Wonderfully decorative framed for a young girl's room, your collection doll room, or just to add joy to your collection! Measures 14" x 11".